"The Flame Pearls Pt.2: Magnetic Island" is the 15th Mandrake Sunday story. The story was written by Lee Falk and drawn by Phil Davis. Mandrake is on a scientific expedition to the South Pacific, looking for flame colored pearls. A tropical storm breaks suddely, the compass going wild, and the Argos is stedily pulled side-ways towards a mysterious magnetic island. 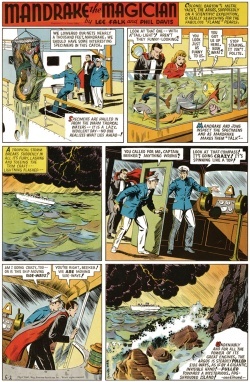 Mandrake, Lothar, June and Colonel Barton reach the shore safely on an rubber raft. On the mysterious floating magnetic island they found 60 men, survivors from ship-wrecks. All enslaved by the escpade murderer, King Cy, and his henchman Jasper. King Cy, giant ruler of the mysterious Magnetic Island. This page was last edited on 26 May 2016, at 05:31.